"I've used this yummy recipe several times with great success. It's become a popular item at parties and brunch in my home." Place sausage in a large, deep skillet. Cook over medium-high heat until evenly brown. Drain and crumble. Spread into bottom of baking dish. 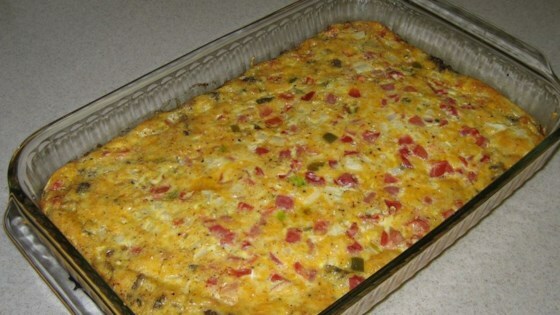 Sprinkle with Cheddar cheese, Monterey Jack cheese, onion, chile peppers, and jalapeno pepper. In a medium bowl, mix eggs with chili powder, cumin, garlic powder, salt and pepper. Pour over contents of baking dish. Bake in preheated oven for 18 to 22 minutes, or until a knife inserted into the center comes out clean. Cool for 10 minutes, then cut into squares. A super-simple holiday brunch is ready in no time. This was okay, but will make some adjustments next time I make it. We preferred the filling as a breakfast taco instead of a casserole. I love this recipe! I've made it many times and many different ways but my favorite is putting fresh sliced mushrooms on the bottom. Yum! I add the mixture to a cupcake pan to make eating the quiche a more convenient! I used Italian sausage and no jalapeno peppers. I also cut into it prior to the 10 minutes of cooling time and drained out a lot of the fat. My picky boyfriend absolutely loved it!